Château du Hureau is located in the small town of Dampierre-sur-Loire, about four miles east of Saumur and 15 miles west of Chinon. The Château itself is an impressive sight, with its 18th-century Mansard roof and octagonal tower topped by a boar-headed weathercock, from which the domaine takes its name — a hureau is an old, solitary wild boar. Behind the Château sits the winery carved into the limestone cliffs during the 13th century and overlooking the Loire River. For wine lovers, the cave is even more impressive than the Château, with numerous paths leading to carved out caverns housing stainless steel vinification equipment and lines of barrels. It reminds one of being in a James Bond movie! Philippe Vatan was thrust into being the sole figurehead at Hureau after the tragic and untimely death of his brother in 1987. As he was involved in a completely different business up until that time, it is a testament to his fortitude and skills as vigneron that he has made such success of this domaine, now considered one of the top in the appellation. 17 hectares, including 21 separate vineyard plots, are spread around the towns of Dampierre-sur-Loire, Souzay, Champigny, and Saumur. The vineyards are planted with Cabernet Franc and are worked organically (certified). What links all of the plots is tuffeau (tufa/limestone), a soft chalk from the Cretaceous period (146 to 65 million years ago). This underlying tuffeau is the overriding factor in Saumur-Champigny's distinctive quality. However, the varying layers of topsoil (it's either fertile clay or sand) and diverse sun exposure, obviously affect every vineyard's personality, expression, and importance in the various cuvées. 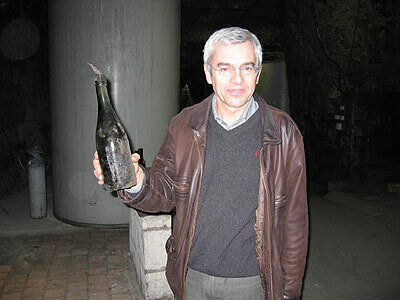 A group of vineyards spread over 17 separate plots of young and old vines produce the regular Saumur-Champigny bottling. Some of the vines are 70 years old. The suppression of the secondary buds in the spring (ébourgeonnage), the summertime crop-thinning (éclaircissage), the selection during the picking, the long fermentations (25 to 30 days), and the élevage lasting from 10 to 20 months in the tuffeau cellars all contribute to the elaboration of a red wine which is rich, smooth, and supple on your palate and that can also age gracefully. Tuffe is Philippe Vatan’s red made from a wide variety of parcels spread across his limestone-rich vineyards. Aged in stainless-steel in an immaculate cavernous cellar, this has classic Cabernet Franc notes that include black raspberry and just the right amount of savory herbs while finishing with well-integrated tannins. We love this wine with pork in all forms: rillettes, chops or roast. Hell, the wine’s versatility makes it wonderful with beef and chicken too. Château du Hureau Saumur Champigny "Fours à chaux"
This vineyard, whose name means hot oven and possibly the site of a former lime kiln, sits atop a limestone/chalk bowl that gets prolonged sunlight during the ripening season. Its old vines create small grapes that have excellent concentration. A step up in complexity from the fantastic Tuffe cuvée, it also retains its ability to be drunk young. It is an excellent wine to pair with anything from pork roast to spicy Asian dishes. 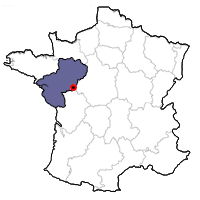 Fevettes is the name of a particular parcel located high above the Loire River. Made from its oldest vines (which are ideally exposed) and aged in foudre, this is an excellent choice for putting away for 5 or 6 years. When its subtle red fruits begin to peak through the limestone rich-rich darkness, the texture becomes silky and the length hauntingly long. Vatan has two daughters named Lise and Agathe, the latter which now works with him. This wine is a tribute to them, made from the top lots of the property’s finest parcels. The parcels’ topsoil (with a higher percentage of fertile clay) is most likely the reason why the silky and mellow tannins are so impressive. They also are the guarantee of a very long aging potential. The vines used for this cuvée go through two sessions of éclaircissage during summer and, as with the other cuvées, the grapes are entirely harvested by hand. It is, so to speak, Château du Hureau's baby, its Grand Cru that reaches full ripeness year after year. For centuries, Dampierre has been considered as the place for Saumur Blanc. With short pruning and green-harvesting (éclaircissage), the 2.5 hectares yield a limited quantity of Chenin Blanc (2 tons to the acre) of exceptional quality. The grapes are harvested by hand and fermented and aged in tank using indigenous yeasts, yielding a fine, textural white that shows notes of apple, chalk and spice. Serve this with Asian cuisine or with medium-weight fish.